When you really should not be spending any money but still do, you can tell those who are concerned that ‘geld moet rollen’: money is there to be spent. The phrase can also be used more formally to say that in order to support the economy you must keep the money moving. – “Geld over de balk gooien/smijten”: to waste money. Lit. “to throw money over the beam”. – “Geld laten rollen”: to spend money freely. – “Veel geld stukslaan”: to spend money lavishly. – “De hand op de knip houden”: to not spend any money / to deliberately live on a tight budget. I believe ‘knip’ refers to the traditional locking mechanism (see picture). – “Geen cent te makken hebben”: to be broke / to hardly have any money. – Geld: money [noun] [het geld, de gelden]. – Rollen: to roll [verb] [rolde, gerold]. – Uitgeven: to spend [verb] [gaf uit, uitgegeven]. – Spenderen: to spend [verb] [spendeerde, gespendeerd]. More formal synonym of ‘uitgeven’. – Inkomen: income [noun] [het inkomen, de inkomens]. This entry was posted in Dutch phrase of the week, DWOTD 1.0, Vocabulary Intermediate and tagged geld, geld moet rollen, munt, rollen, spenderen, uitgeven by Sander. Bookmark the permalink. Regarding money I love the Dutch expression “voor een kwartje op de eerste rij willen zitten”! That’s where you see that the Dutch are not (necessarily) thrifty. I’m a French guy who learns Dutch as an autodidact. I have recently discovered your nice website. 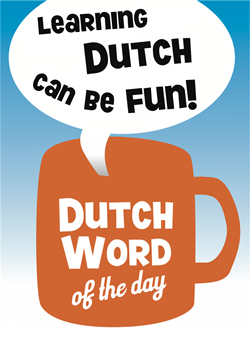 I love languages and I think Dutch-learning can be very interesting in order to improve my skills in English and German. I have a little question concerning the expression Geld over de balk gooien/smijten. What’s the pratical difference between gooien and smijten ? In which case will I use the first instead of the latter ? – Alexandre smijt boos zijn tas in de hoek. – Alexandre gooit zijn tas op zijn bed. Bedankt en houd het goede werk vol ! Leuk zeg al die uitdrukkingen! – “Geen cent te makken hebben”: to be broke /to hardly have any money. –> maken met één k, toch? Hi Phil – good observation! It is actually with two k’s and also I believe the only instance where we use ‘makken’. The word has a different origin than ‘maken’.